I prepared the following dish for my Chilean wine & dine event. This recipe calls for wine so I naturally used a Chilean Chardonnay... but you can use whatever white wine you prefer. I would also suggest serving this over rice too! Heat 2 tablespoons of olive oil in a large deep pot or Dutch oven set over medium-high heat. Add the chicken pieces and fry on all sides until golden brown, about 3 minutes. Add the onion and garlic; cook and stir until tender, about 2 minutes. Pour in the wine and stir to loosen any bits of food that are stuck to the bottom of the pot. Pour in the chicken broth and bring to a boil. Add carrots and peas, and season with cumin, paprika, salt and pepper. Reduce heat to low, cover and simmer for 25 minutes, or until the chicken easily pulls away from the bone. 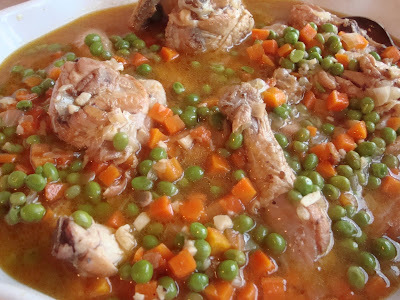 To serve, place a piece of chicken onto each plate, spoon some of the carrots and peas with the cooking liquid over it and top with yellow rice. Hi! We are on Twitter but don't use it as often as other social media platforms. Feel free to follow us @WC_Chicago!